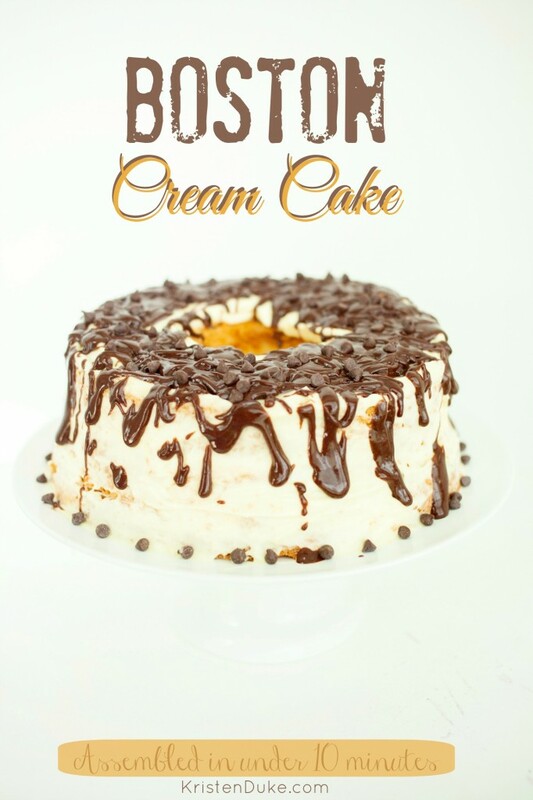 Do you love Boston Cream Pie or Eclair type donuts? If so, I’m pretty sure you’ll love todays recipe! 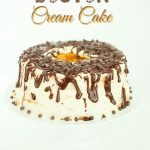 Once you have the 5-6 simple ingredients, this Boston Cream Cake 10 minute assembly dessert is SUPER easy to make, and a crowd pleaser. I teamed up with Kraft to share a recipe they have on their site, with my simple twist of my own. This recipe starts with the base of an angel food cake. You can make your own, but I just purchased a ready-made cake at the store. It gets sliced horizontally twice, spreading the vanilla pudding/COOL WHIP mixture in-between each layer. My girls helped me add some chocolate chips in the middle, too. 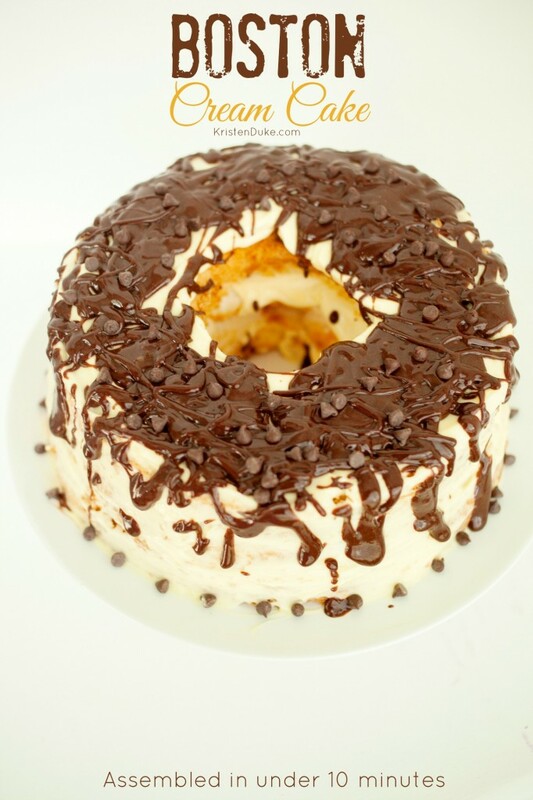 It’s then topped with rich chocolate and more chips for texture! 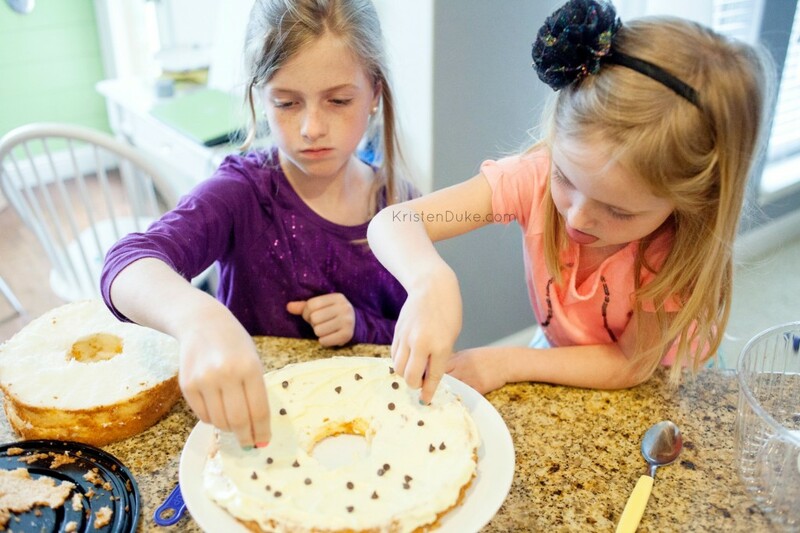 My girls love to help me in the kitchen, and this recipe was a great one to have them participate in. 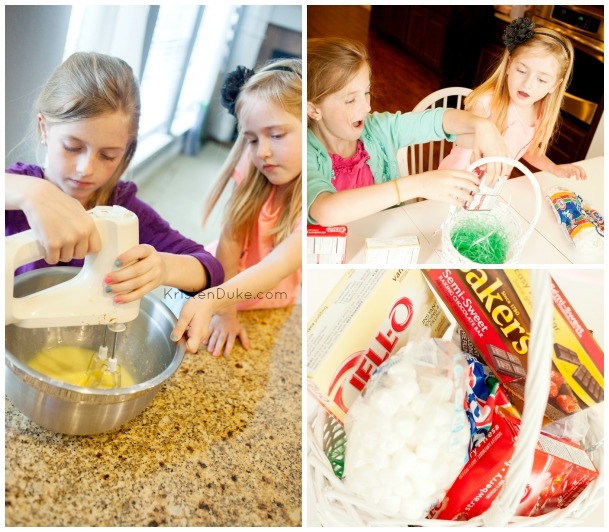 This delicious dessert is easy to assemble, and the kids can help! STACK cake layers on plate, spreading pudding mixture between layers, then all around outside of the cake stacks. Once the ingredients are assembled, refrigerate for an hour for best taste and results. This is the first of three recipes I’m making with Kraft products this week. I was sent this cute little Easter basket from them, which my girls also loved looking through. If you need a simple recipe for Easter weekend, give this one a try! I got two thumbs up from my (often picky) kids, plus a bunch of 16 year old boys that were here over the weekend to help us eat it.